May 9th marked Victory Day in Russia, one of the country’s biggest holidays, which commemorates the national victory over Nazi Germany during World War II. For the first time since the collapse of the Soviet Union, ballistic missiles and tanks rolled through Moscow’s Red Square, as jets and bombers flew by overhead (see video below). 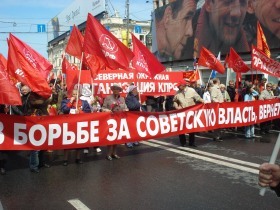 While many spectators came out to watch the military parade and listen to speeches, a large contingent of supporters of the Communist Party (KPRF) marched through central Moscow and expressed outrage at the Kremlin, the Sobkor®ru news agency reports. Gennady Zyuganov, the leader of the Communists, led the procession. Speaking before the crowd at the Teatralnaya ploschad, Zyuganov said that for this holiday, the authorities had only given one present to veterans – higher prices for consumer products and public services. Zyuganov added that all the military gear rolling through Red Square was created during Soviet times, and that no new technology was being created. He went on to say that not one new factory had been opened in recent memory. The Communist leader then accused Russia’s Finance Minister, Aleksei Kudrin, of letting capital flow out the country at a time when funds should be allocated for the country’s social services. Zyuganov also thanked supporters who voted for him during presidential elections, and who cast ballots to bring the KPRF into the Parliament. It should be noted that before the event began, 20 members of the Council of Orthodox Banner-bearers who tried to join the Communists, were arrested. The group was charged with breaking the picketing rules. Arrests also took place at other demonstrations in the city. Four youth activists trying to unfurl a banned reading “No to fascism of all stripes,” were nabbed by OMON riot police, as was a nearby photographer. Another opposition activist, Suren Yedigarov of the United Civil Front, was leading a solitary picket against President Dmitri Medvedev when the militsiya tried to grab his sign, and then detained him when he resisted.